The Rufous-bellied Eagle (Lophotriorchis kienerii) is a bird of prey in the family Accipitridae, which also includes the buzzards, hawks and Old World vultures. It was earlier placed under the genus Hieraaetus but this eagle may well belong to a separate genus. The name of Kienastur had been suggested. Rufous-bellied Eagles breeds in tropical Asia. 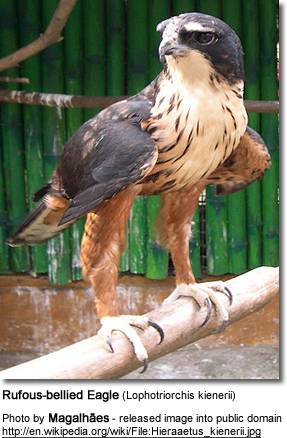 They are resident in Sri Lanka, southwest and northern India, and east to southeast Asia and Indonesia. This species is associated with woodland. The large stick nest is built in a tree and a single egg is laid. Rufous-bellied Eagles are smallish eagles, 54–60 cm long. They have broad rounded wings, held flat while soaring, and a short broad tail. The adult has blackish upperparts and head. The foreneck and breast are white, and the tail and flight feathers are white barred with dark. The rest of the underparts are chestnut. Males and females look alike. The immature eagle has white in place of the adult's chestnut plumage, and dark flank patches. They feed mainly on birds and small mammals.